Open Windows Explorer by going to the 'Start' menu, 'Run' and typing in 'explorer' and clicking 'OK'. Click on the 'extrastuff' folder. Right click on 'esoteric.epi' and click 'Copy'. 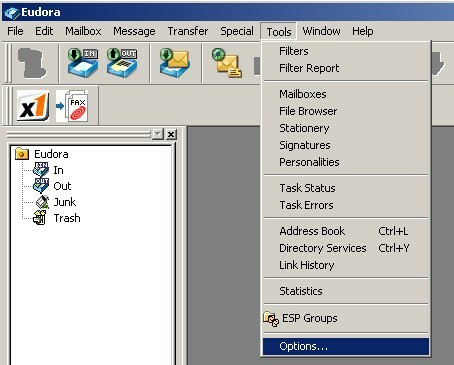 Click back to the Eudora main directory where the Eudora application file exists (Eudora.exe). Right click somewhere in the white space between the icons, and click 'Paste'. Scroll down to the very bottom of the categories list on the left hand side to the 'Ports' category. 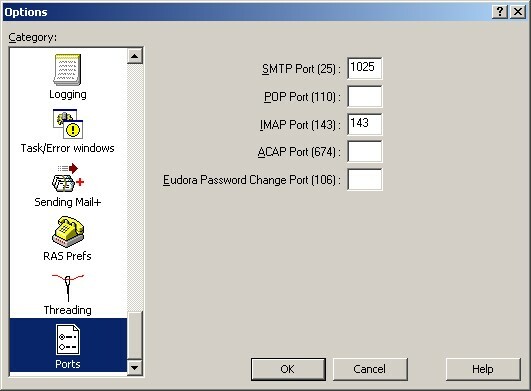 In the 'SMTP Port (25)' type in 1025 and click 'OK'.